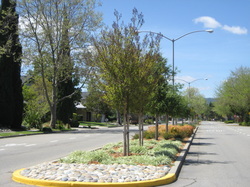 Tanaka Design Group worked with City staff and a citizen task force over a two-year period to prepare a streetscape master plan and design guidelines. 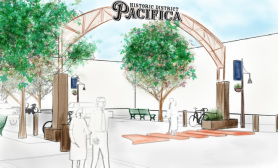 New housing and retail development in San Francisco’s vibrant Richmond district is inspired by the historic Alexandria Theater, which will be completely renovated as part of the project. 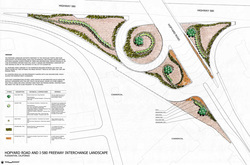 Tanaka Design Group prepared a dynamic landscape design with a 'Swoosh' theme that is an artistic response to the movement of speeding vehicles passing through or into and out of the city. 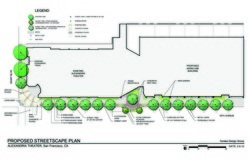 The existing two-mile long path and greenway located beneath the BART tracks is in need of major site improvements, in response to increasing maintenance, aesthetic and safety concerns. 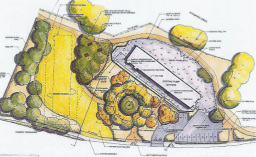 An existing open space on East Bay Municipal Utilities City property has been transformed to serve as a trailhead and passive recreation area. 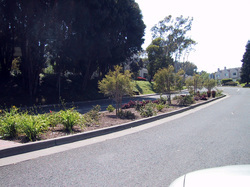 An existing median stretching east of Santa Rita Road for over one mile, the outdated landscaping is replaced with new plant material while maintaining the stately sycamore trees.